Barcoding of serials will vary depending on how, and with what other issues or titles, they are housed. As with all materials, there will be one barcode per physical unit. The Enum and Chron fields in the item record will be filled in following Cataloging and Metadata Services standards. A singly bound or housed issue will have one item record and barcode per issue. Multiple issues bound together will share one item record and barcode. Multiple issues housed together in a box normally will share one item record and barcode. (If it becomes necessary to shift box contents, item records will then have to be updated to reflect changes in the Enum/Chron fields. Do not barcode and create item records for isolated issues or volumes of serials or multi-part monographs. 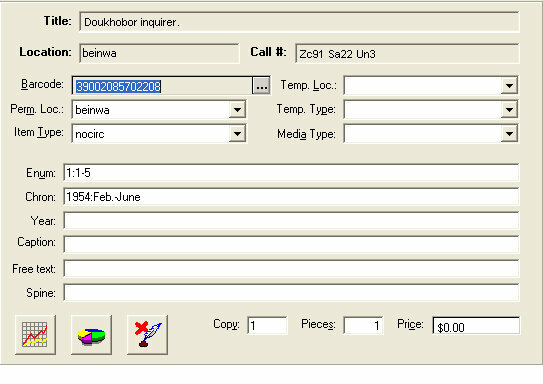 Item records, with corresponding barcodes, are created for all issues/volumes of a title or for none. Create item record by clicking on "New Item" icon with MFHD active. All necessary fields will be automatically filled in except for Enum and Chron fields. Save the item record to the DB. Affix the barcode label per guidelines. Numbering information for the first and last issues is always recorded in the Enum and/or Chron fields for serials. These fields reflect what is in the volume, Gaylord, box etc. and need to be updated when issues are added. Record enumeration designations in the the Enum field, generally in the way they are written on the item. If the enumeration in the MFHD includes captions, do not transcribe the caption as part of the enumeration. (99-105 (NOT no.99-no.105); 2:4-3:6 (NOT v.2:no.4-v.3:no.6). Record chronological designations only in the Chron field. Record month/season and day if needed, i.e., 1774:Mar.1-1775:Feb.26; 1776-1777. Repeating numbers: If the designation consists of a year and a number that is a division of the year, give the year before the number in the Chron field. In parentheses, give the month and day if present. e.g., 1865:no.1 (Jan.3). Alternate numbering schemes: Record alternate numbering schemes matching in Enum using parentheses, matching the marking on the item (e.g., "v.2:no.9(1839:Mar.19)=whole no.160" in the MFHD would be recorded as "2(160)" on the piece and in the Enum field. Label printing program. Even though Beinecke does not use a label printing program at the present, we will try to keep lines to 13 characters, except for special cases (e.g., newspapers which might have long Chron fields). To do this, we will insert a blank space that would force a line break if we were using a label printing program. Boxes and Gaylords will contain only 1 copy, where possible. This has not been done in the past. When we run across a box or Gaylord that has "Copies 1 & 2" we will separate them so that "Copy 1" is in 1 container and "Copy 2" is in another container. Generally do not record other data in the following Voyager item record fields: Year, Caption, Free text or Spine. Exception: In Free text, record "Loose issues" or "Bound volume" as appropriate. When supplements and indexes are recorded in 867 and 868 respectively, record Suppl. and Index in Chron, following the chronological designation if there. For more information on material accompanying an item see Accompanying material.